We only have one little vineyard, not far from the Goldert GC, but on a totally different soil type (less calcareous and richer) planted in Gueberschwihr with Gewurztraminer. According to new ‘village’ wine regulations and because we are the only estate to claim the name of this village, we will not be permitted to continue this tradition. The combination of limestone and lighter sandstone elements allows this wine to express every year some interesting floral aromatics. It is also a late ripening area which is harvested usually at the same time as our Muscat Goldert, so we don’t allow too much over-ripeness in this wine. In 2010 the grapes were very healthy and the fermentation managed to go through, so the wine became quite dry. 3/2012: the nose is in the middle between a very floral expressive perfumed type and a more austere mineral spicy Gewurztraminer. The very slow fermentation helped this wine to gain more complex spicy character. There is a great zesty mouth-feel enhanced by a dry finish. This vineyard produced an interesting complex wine in 2010. 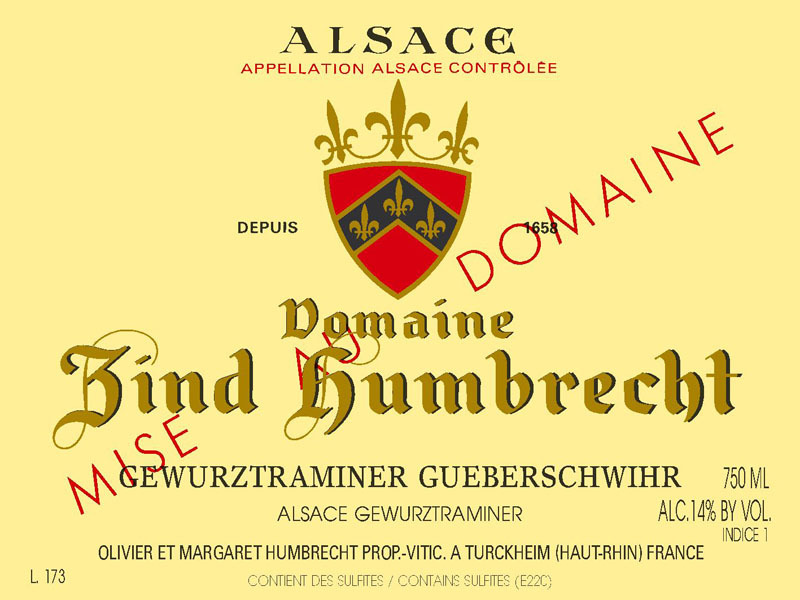 The finish is elegant and will probably satisfy the non Gewurztraminer lovers!